“Why did Jesus have to die on the cross? Why did he have to come at all?” He leaned on the counter and waited for my response. So I launched into an explanation of the Biblical story and the themes of sin, sacrifice, forgiveness, new creation, etc. I was just picking up steam and feeling satisfied about how it was going when he cut me off. I was explaining the Incarnation and the Crucifixion within the Christian framework. He was asking me to pull back those curtains and help him peer inside. Why did God decide to do any of that at all? 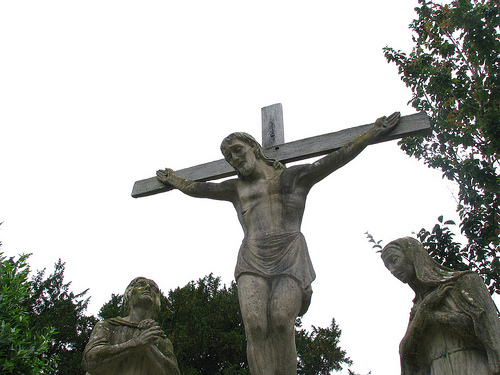 Why would he want to put himself through the pain and humiliation of the Crucifixion? What was God’s decision-making process? We have all seen (and probably filled out) the chart where you list the pros and cons of a decision in two separate columns. Then you compare the two columns and your decision is supposed to be obvious. My friend wanted me to help him see God’s pros-and-cons list. And my blog readers were going to be blessed enough to get to read my answer in a future post. As bad as we want to understand the reasons why God has acted in the ways that he is, this is not something that can be known by us outside of what He has revealed to us. We are not God. We are creatures, and our stance toward God must always be as creatures approaching their Creator. We cannot demand that his ways be understandable to our minds. There is no doubt that God could have devised another plan to save the world. So why this one? I don’t know. Though that answer is not going to satisfy the unspiritual person, it’s still true. Besides, we shouldn’t expect it to satisfy the unspiritual man, for he hasn’t encountered the transcendent God. God would become less god-like. Stop and consider this question. Would you expect the ways of a transcendent, all-knowing God to be beyond our abilities to understand them? I think even an honest atheist would admit that we shouldn’t expect to understand fully the ways of such a God. My skeptical friend would have learned to approach God’s as fully understandable by us. I would be encouraging my friend to believe that God can be fully understood, which isn’t the Biblical view of God. We know about God because He has revealed Himself. I cannot pretend –– and I shouldn’t teach others to pretend –– that I can understand things about God that He didn’t reveal. God did not explain the Incarnation outside of the concepts and beliefs of the Christian worldview. I don’t know why God chose to save the world the way He did. But as a creature I have to recognize that there are many things about God that I cannot explain unless He has revealed that to me. In this case, He hasn’t. So there’s nothing I could do to help my agnostic friend.